Replies: 4224 (Who? ), Viewed: 221045 times. #1551 12th Mar 2017 at 12:08 PM Last edited by smorbie1 : 12th Mar 2017 at 12:20 PM. It's almost Purge Day in the communist burg of Monopoly. The Council has noticed that, despite tight controls on births, the population numbers seem to be creeping up. They have attributed this to high numbers of multiple births as well as rogue gypsies and other supernatural practitioners restoring youth, extending lives, and resurrecting the dead. (They don't know about the somewhat common practice of hiding unsanctioned children). Therefore, they have decreed that midsummer's day is now purge day. Representatives will be going through the land purging it of the elderly, returning all animals back to the shelter to be adopted by other families, and randomly reducing the size of large families. The only exemptions are families expecting sanctioned babies. Anyone else can be purged. It's going to be interesting. The first family visited was the family of Chrysanthemum and Faunus Bell. They were expecting their second Council-ordered baby, so their family was exempt. Cyril Baker is really showing a lot of interest in Crystal and asked her out on a date again. They have developed a crush, and they seem to have quite a bit in common (both are knowledge sims) so I think we'll have our next couple here. Charles, Eleanor and Roger are teenagers and have teen jobs which help a little bit, and Marjorie and Christian go to school now, which leaves Sophie plenty of time to do the house chores. And what about my fave boy, Steve? Oh, well, he's always looking for trouble, isn't he? The other day Carol asked him out. Carol is married and a mother of one, but it seems that she is quite bored in her marriage and decided to relight an old fire. Which of course he was veeeery willing to. (Her daugher caught them, which stressed the little one a lot, but Carol decided to enjoy herself no matter what). That was his normal behaviour anyway. He never says no, hehe. It seems his past experience (he is divorced from Chloe Hunicke) has not taught him better, and so he went ahead and proposed! I 'cheated' lately by playing some households a little longer than I'm supposed. Today I played the Williams household for 5 days instead of the usual three. There was just too much going on for me to not keep playing. Camille and her twin brother Seth were supposed to head off to college together but since she got pregnant and got married, Seth left without her. Camille's LTW is to get to the top of the dance career so college wasn't a necessity for her. Camille aged up and cried of course. Welcome to the REAL world Camille! Camille's step-father Jake achieved his LTW of owning 5 top level businesses. (I actually do cheat with that since I consider it an impossible LTW to complete unless I use aging cheats) Once he completed his LTW he made a call and sold his business and retired early. They've got more than enough money in their savings to live off of for the rest of his life. His wife Hannah also had some good luck at work, she got promoted to studio musician. Camille finally found a job in the dance career. Its at level one but its better than nothing. It certainly pays better than the gig at the record store. Little Kailyn aged into a toddler and her father Eric aged into an adult. Eric has been staying home to help with Kailyn while Camille worked. He was also working on his college degree. He just has a paper to do and he'll be done! I gave him a makeover since he'll be getting into the education career. No mohawks allowed! The only person who didn't have much going on was Brett. He was grounded since he got a D at school but he brought it up to a B by the end of their session. 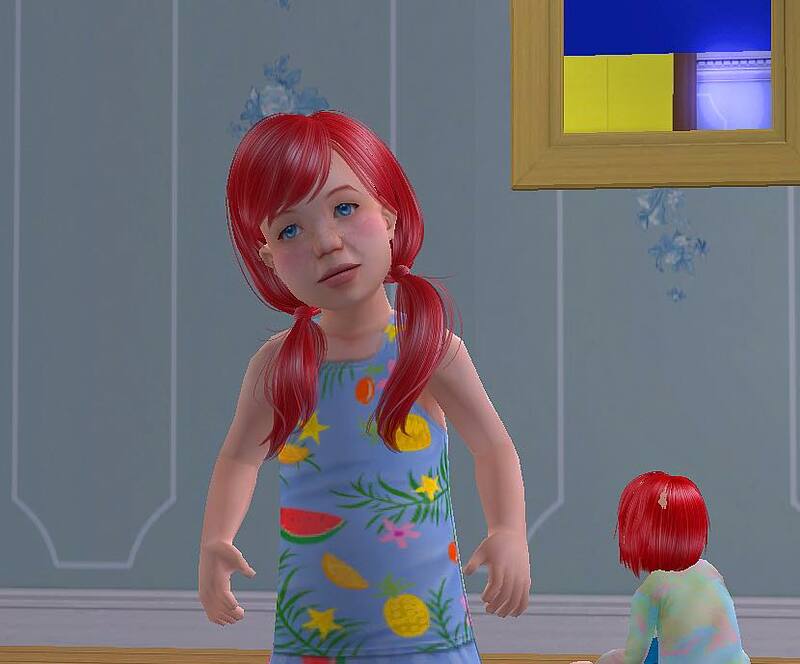 Little Kailyn will age up into a child the next time I play them which means Camille and Eric will have to move out of that basement and into their own home finally. Hopefully Eric finds a job ASAP because Camille is pregnant with baby number two. Jake will be happy to finally have his basement again. He hasn't had his pool room since he married Hannah and they renovated it into the kids' room. Yup, he's definitely looking forward to retirement. No more kids, no chaos, just his pool table, giant screen TV and his wet bar. But I think Hannah wants to make it her studio so we'll see what t he result will be. Happy wife, happy life after all. I finally got around to fixing Jessica Picaso's blank want slot problem. Sent her to a community lot - nope. Sent her on a date - she rolled date wants, but it went blank again afterwards. I moved the family out and back in - nope. I then went into SimPE, deleted her SWAF history - still nope. Then I moved her out and back in again following this (just on a hunch, really) and suddenly they started rerolling properly. If anyone has any idea what I managed to do, I'd love to hear an explanation. It's the magic move-out-move-in spell. It fixes a lot of glitches, but is annoying because you have to refurnish everything all over again. That might not seem like a big deal, but my OCD requires I furnish one room at a time, one day at a time, at precisely midnight. So...my sims sometimes suffer by living on the lawn or without necessities for many days. That's not tooo bad. The last few times I've felt the urge to decorate, one of my sims was reading the news on the throne. So what I did was, being the impatient plumbbob that I am, to turn moveobjects on, and grabbed sim + potty and shoved them in the backyard while I redecorated. In the dead of winter. At night. Happened to Hal Capp, *twice* (he just looked baffled), and to Consort Capp (Juliette was unimpressed). So, uh, I bought them a new crapper afterwards. I suppose that makes it all right! I do that, too. If a sim in interacting with an object, I move it outside, so they don't bother me while I redecorate. Sometimes I delete it afterwards, sometimes they just learn to do whatever it is outside. So, as my OCD counting would have it, the whole family was purged, except for Unity's newborn baby (just because you can't kill infants), and the Sapphire's middle child, Second Samuel. Someone had to be there to grow the baby up. #1558 13th Mar 2017 at 1:16 AM Last edited by srtv : 15th Feb 2018 at 8:36 PM. I let to your imagination what Hailey saw one day when she returns to the house, but the fights that came after that were great, after some days, and by the advice of some friends, Hailey pledge to the Tri-Var Sorority, and she was accepted. Right now, she holds a lot of grudge against her brother and her former bf Colin, in the meanwhile Colin and Harry are living a great life, but the money is less everyday, so maybe is time to one of them to search for a job… they don’t know that Hailey is plotting a great surprise for both of them. At Tank Grunt's Temporary Home, matters were getting ridiculous. Blossom fell asleep on the pavement in front of several visitors, who were rightfully suspicious. When Tank got back from work, he hurriedly hustled Blossom behind the toilet block. "I found us a place we can afford, at least for a start," he said. "Not much -- unfurnished efficiency, really -- but look, it's not far from here, and Michelle Tse got me a good rate. Grab stuff fast, and let's get out." "What's the rush?" Blossom asked, looking around the corner at where Klara was reading War of Love on a bench. "We're not taking her," Tank said, as if reading Blossom's mind. "She's perfectly self-sufficient here. You can come by and make sure she's all right...if you like...but, Mrs Grunt, I think it's high time we make a home for ourselves. And just ourselves. We never even asked her to show up..."
Blossom felt slightly guilty about leaving Klara...but only slightly. While she had no intention of admitting it to Tank quite yet, she'd like to have a baby herself. That meant finding a more stable manner of living, and being burdened by their still-somewhat-disagreeable dorm-mate and her own impending offspring was not part of that. Klara smiled smugly as she closed the book after the Grunts had left. Of course she knew they were bolting on her. She didn't mind -- this would give her a chance to better herself -- but it would always be advantageous to have them think they'd wronged her. The same went for others... She called Cyd Roseland, kissed him in front of some townies when he arrived, played with Porthos, and convinced Cyd that he had some responsibility for her. The evening she spent filling the little lot with people for one last party, which included having Buzz Grunt over and telling him that his son had gone off and left without her. Feeling he couldn't leave a pregnant woman homeless, Buzz somewhat grudgingly said she could come stay in Strangetown with him, which Klara had no intention of doing -- however, this statement caused Cyd to make a grand gesture and invite her to share the comparative luxury of the warden's apartment at the prison she had been quite recently released from. This was the sort of thing Klara had been looking for! To be objective, SimCity Prison could use Klara's presence. Being Saturday, it was a day Leod McGreggor was on duty...on duty in the facility now confining his wife's attacker. Frances Worthington was raising a stink about how ruinous imprisonment would be to his future -- so he'd gotten in a fight and forgotten about going to court -- so what? "Please stay quiet and let me do my job," Cyd advised. "Here, you can have a chess table in your cell. No, you can't go to the rec room. I'm sorry, but this is for your own safety." He returned to the corridor, trying to avoid looking into the adjoining cell where Leod was currently looming menacingly over Gilbert Jacquet Delarosa. Cyd called Leod out to help him with paperwork. Leod did so reluctantly, while Gilbert ostentatiously went back to writing in his newly-started diary. Cyd wondered what exactly would happen if a guard should happen to kill an inmate. It would probably be him getting blamed...well, he couldn't blame Leod for being furious, but he really wished he could spare him enough to send him home. When Cyd invited Klara over as dusk neared, Leod was waiting his chance. He went off to feed the prisoners as Cyd and Porthos went to greet Klara -- or rather, feed one prisoner. Rather than being fed, Gilbert got loomed over again. Gilbert's nervous attempts to placate Leod by showing him the bad renditions of bows he'd seen did nothing for him; he was slapped and poked, shouted at and insulted, and as Jane Stacks approached on her first shift, was locked in his cell with no dinner. Leod told Jane he'd already seen to the feeding, so she could do some cleaning. As soon as she arrived, Klara's reaction was to point out that there were rats in the prison yard. Porthos took care of that problem swiftly enough, leaving Jane to dispose of the now-dead rats. Klara went to stomp on bugs. It turned six PM, and Cyd asked Klara to move in. Of course she agreed, and after kissing Cyd, showed herself a productive force for order; she sent him to bed because he was exhausted, bathed Porthos, cleaned up the resulting mess, filled the dog bowls scattered around the prison, and cheerily cleaned Cyd's apartment. It was a fair trade for him putting three sunlamps in the place, after all! She also got in some jogging on his treadmill under one of the lamps. It might not actually be so bad an idea to have a family in the prison...except that the authorities will not approve, and Cyd's about to be in big trouble anyway. That night, as a highly-neglected Gilbert tossed in his cell, Leod went off duty with intent to see just why Cyd was shacking up with a former inmate, and both Grand Vampires stalked the sidewalk...looking for Gilbert? Who knows? Sheffield was a thoroughly spooky place tonight. The Crittur puppies aged up, but although they were supposed to be brown and white, they were completely black, eyeless shadow-dogs roaming around the house. Michael put a collar on the one he wanted to keep (Pluto), which turned the dog normal, and the other two appeared normal once they got outside on their way to the adoption centre, so I hope they're going to look normal in the shelter! Then Dora Ottomas decided she'd had enough of resting in peace and spent the entire night scaring her grandchildren. Poor little Sally got the worst of it: she came close to having the Social Worker called because she got so hungry, she wet herself at least once, and Dora scared her again just as she was trying to get into the bath after wetting herself. She was just about falling over with exhaustion when daylight finally came, so it's a good thing it wasn't a school night. The twins eventually went out the front to play catch, and Dora didn't bother them out there. Despite all this commotion, Samantha managed to get pregnant again. [QUOTE=smorbie1]I do that, too. If a sim in interacting with an object, I move it outside, so they don't bother me while I redecorate. Sometimes I delete it afterwards, sometimes they just learn to do whatever it is outside. I know, and I have it, but my OCD means I can't use it, unless it is added to the family stuff by my counting. Also, Pescado said that everytime someone used it, a pixel kitten would die. Now I know he can't do that; I really do. But I'm kind of afraid he really can, and I can't stand the thought of kittens dying. This message has been deleted by terula8. I played the apartment complex where the Montt family lives after Julia moved out of there to get married, and I don't know why, but everyone started fighting with everyone. The worst offender? Jane Stacks, who insulted everyone who tried to socialize with her and started making weird faces just because. Looks like she still can't get over the fact that Castor Nova got engaged to another girl, and it doesn't help that she has to raise three small kids, pay the rent, the bills and buy food with barely any money to spare (last time I checked, she only had around 500 simoleons). You got yourself into that mess, and attacking the Montts (Castor is living there with his fiancée) is not going to change anything. This was not a very exciting rotation though. Pretty much the expected. Cyril keeps dating Crystal, Richard got engaged to Pdri (and they are likely to get married in the next rotation), Cynthia and Derrick got jobs, etc. etc. Of course Steve Palmer & co being the exception to all the dullness. In the meantime Chloe decided to flirt with Ricky Mace, who happens to be Steve's roommate. Such a tangle! When the Purge committee knocked on the Clovenhoof door, they heard children playing upstairs. The sanctioned babies were accounted for, but someone was upstairs. They unblocked the stairwell, and discovered the teens hidden away. The entire family was purged. Tiffany, the dog, was confiscated. The only survivor is Violet Clovenhoof, newly grown to toddler. She is the Placeholder, Keeper of the Genes. Unseen University has arranged to share its campus with the teaching houses of the Guilds. So there is a dorm for Assassins, another for Alchemists, a third for Seamstresses, and of course a fourth for Wizards. The wizards swoop in and out of the community lots on broomsticks. The Assassins are filling up the college graveyard with their practice, mostly by throwing axes. No passing professor is safe. The Seamstresses are training for the oldest profession, and making friends fast. Today I have been overseeing work for the Alchemists. In their workroom there is a robot station, a toy-making bench, and a flower-arranging bench. Tosha Go won her place in this traditionally masculine university by arriving with a gold badge for flower arranging. She has put a snapdragon bouquet in every room in the dorm, and pink pollen puffs over students, though I can't see that it gives them much advantage. The alchemists' workroom is a hive of activity, with hammers pounding all day long. Setting up a medieval fair since now there is even more items. The dog course, the medieval munchies and the medieval stalls from PBK. Nothing, because I spent the whole day downloading new hair/clothes and didn't actually play! Reshifting people in and out of houses, one baby born, not so much drama, yet. Birth rate is still low, despite the pixels' efforts. The Grunts went to Three Lakes for three days. My head cannon is that this is where their family originally came from. While Ripp and Buzz didn't fish together quite enough to get positive STR/LTR, Tank and Ripp did. Good kids! I also enjoy watching them slap dance, so they have to learn that skill. I posted this on a few Sims Facebook groups (I am so addicted to those) but have been checking with this thread for awhile and figured I would contribute! Wow I really missed Sims 2 I took a hiatus from actually playing it to make stories and movies, but I decided to give it a shot at the build a city challenge with my sim Hana Honeycutt. She founded the city of Sugarton (where she is the only inhabitant, save for a few homeless wandering townies). Well her husband Toby brought in no money when they married and I wanted to hurry with the babies so I could prosper quickly in the challenge well lo and behold, they had a pair of twins!! Thankfully miss Hana was quickly advancing her creativity skill and selling paintings and writing novels was barely keeping us afloat. But!! Now Hana's rolled a want to have ANOTHER CHILD Dx And I know she'll have at least twins (I gave her the Fertility reward since she has the family aspiration) so I'm like nah lol lady you're done. At least for now because you and hubby do make cute kids, but how about let's take a break from the babymaking (and more importantly, taking care of them?? I had to replace the cribs with pet beds so they could put themselves to sleep, it was so bad).